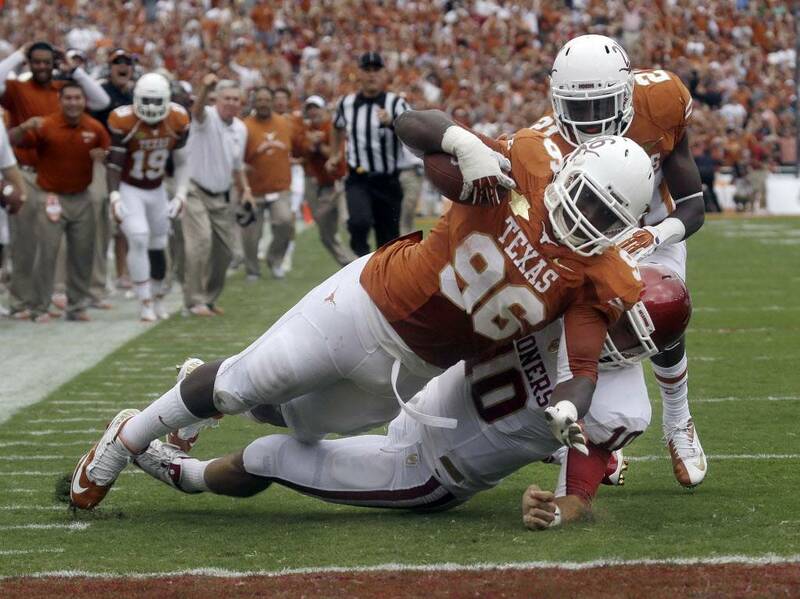 Longhorns defensive tackle Chris Whaley dives over the goal line to score a touchdown against Oklahoma. The stretch of 2001 – 2009 was a good time to be a fan of the Texas Longhorns. During that time frame the team had at least 10 wins each year. They also had three wins in BCS bowls and one National Championship. Who knew that January 10, 2010 would be such an ominous night for Longhorns fans? That night was the BCS Championship game between Texas and Alabama. Texas started off well, but then quarterback Colt McCoy was injured and all chances of winning a second national championship in a five year span went down the drain. That loss was also a turning point for the entire Texas football program. Since that night, the Longhorns have gone 25-18 and only 13-15 in the Big 12. Over the years, Texas – OU has been one of the classic rivalries in college football. The last three had gone to Oklahoma and the last two were not even close. The last two years Oklahoma had won by a combined score of 118 – 38. This year Texas came in as a two touchdown underdog. So far this year, the Longhorns have been a hard team to figure out. They started the year with a blowout win over New Mexico State, but then were thoroughly embarrassed by BYU and Ole Miss. The BYU loss was particularly troubling, giving up 550 rushing yards and 259 of those to BYU quarterback Taysom Hill. That performance led to the dismissal of defensive coordinator Manny Diaz. Former Longhorn defensive coordinator Greg Robinson took over the defense and after losing to Ole Miss, Texas was able to get rebound wins against Kansas State and Iowa State. Not many people outside of the Texas locker room gave the Longhorns a chance of ending the Sooners win streak against them. The Longhorns received the opening kickoff and the game plan was obvious from the start. The Sooners had changed their defensive alignment to a 3-3-5 defensive scheme in an effort to match up against all the spread offenses in the Big 12. The Longhorns decided to attack the smaller defense with the inside running game and it worked in their favor. They drove 61 yards in 15 plays (8 of them runs) to begin the game. The big play of the drive was a 22 yard pass from senior quarterback Case McCoy to sophomore receiver Kendall Sanders. Anthony Fera connected on a 31 yard field goal to give Texas a 3-0 lead. The Sooners answered on their first drive. A 24 yard run by sophomore receiver Sterling Shepard gave the Sooners the ball at midfield. The drive eventually stalled on the Texas 17 yard line and they kicked a field goal to tie the game 3-3. On their next possession, Texas drove the ball to the Oklahoma 23 yard line, but junior running back Joe Bergeron fumbled the ball and sophomore defense end P.L Lindley recovered for the Sooners. Three plays later, the Longhorns grabbed the momentum. Sooner junior QB Blake Bell threw over the middle and Longhorn defensive tackle Chris Whaley picked off the pass. The 300 pounder ran 31 yards and dove over the goal line to put the Horns up 10-3. On their first drive of the 2nd quarter, McCoy drove his team into scoring position. Longhorns coach Mack Brown decided to roll the dice and went for the first down on 4th and 2 from the Sooner 23 yard line. McCoy’s pass was incomplete and the Sooners took over on downs. After forcing a 3 and out, the Longhorns extended their lead. McCoy hit sophomore receiver Marcus Johnson for a 59 yard touchdown pass to extend the Texas lead to 17-3. The Longhorn defense again stepped up big, forcing a Sooner punt and they got the ball back at their own 47 with 6:07 left in the half. Using mostly the running game, the Horns moved it to the OU 33 yard line. From there, Anthony Fera showed why Texas was interested in him when he was at Penn State. The former Nittany Lion transferred to Texas last year, but was injured the entire year. This year he is healthy and he showed how strong his leg is. He converted on a 50 yard field goal to extend the lead to 20-3 with 3:22 left in the half. Senior running back Roy Finch gave the Sooners great field position by returning the kickoff 73 yards to the Texas 23 yard line. Four rushing plays later, the Sooner scored their first touchdown of the day. Senior running back Damien Williams took it over from 3 yards out to cut the lead to 20-10. It appeared the Sooners thought the Longhorns would run the clock out, but they continued to attack. A 13 yard run by junior running back Malcolm Brown and an 18 yard completion from McCoy to junior receiver Jaxson Shipley gave them the ball at the OU 26 yard line and Fera connected from 43 yards out to make the score 23-10 at the half. The Sooners got the ball to start the second half. A 29 yard pass from Bell to senior fullback Trey Millard gave the Sooners good field position and they settled for a 37 yard field goal to cut the Longhorn lead to 23-13. The two teams traded punts on their next possessions. The Longhorn special teams stepped up after a Sooner punt as sophomore running back Daje Johnson fielded the punt at his own 15 yard line and raced 85 yards for a touchdown. The Sooners blocked the extra point and the Longhorns led 29-13. On the Sooners next possession, Bell was picked off by Texas corner Duke Thomas. The Longhorns capitalized on the turnover when McCoy completed a 38 yard TD pass to senior receiver Mike Davis to extend the lead to 36-13. The two teams swapped punts on the next two possessions. With 11:00 left, Oklahoma created a break when junior defensive end Geneo Grissom picked off a McCoy pass and the former tight end ran it 54 yards for a touchdown to cut the lead to 36-20. Oklahoma had one more chance with the ball with 7:15 left in the game. They drove to the Texas 9 yard line, but on 4th and goal, senior defensive end Jackson Jeffcoat sacked Bell to turn the ball over on downs. The turnover gave Texas the ball with 5:14 left and they leaned on their running game to run the clock out and getting their first win against OU since 2009. The win moves Texas to the top of the Big 12 standings with a 3-0 record. This was easily the best the Longhorns have looked this year. It was a total team effort, getting scores on offense, defense and special teams. They were much more physical than Oklahoma and played with heart which seemed to be missing earlier in the year. The Longhorns offensive line dominated the small Sooner front. Two running backs went over the 100 yard mark, Jonathan Gray with 123 and Malcolm Brown with 120. The Longhorns also shored up their tackling problems and held OU to only 263 yards of offense. Texas will get a week off before traveling to Ft. Worth to face the TCU Horned Frogs. Oklahoma did not look good in this contest. They were not physical and the passing game was almost non-existent. The play calling for the Sooners was very strange. Blake Bell is known as a strong, physical runner that has issues throwing the ball down the field. Bell only ran the ball 7 times which included 4 sacks. It looked like the Sooners were determined to make him a pocket passer and the scheme did not work at all. The Sooners get a chance to make up for the loss this weekend when they travel to Lawrence, Kansas to face the Kansas Jayhawks. Case McCoy, QB, Sr: Younger brother of former Longhorn and 49ers quarterback Colt McCoy. Lacks great size. Kinda skinny. Has a bit of a sidearm passing motion. Competitor that likes to attack the defense. Pocket passer that is very little threat to run. Tough, willing to stand in the pocket and take hits. Nice touch on deep balls. Completed 13/21 for 190 yards, 2 TD and 1 INT. First Texas QB to beat OU since his brother. Malcolm Brown, RB, Jr: Good combination of size, speed and power. Would be starting for most teams. Good pad level. Spins out of tackles. Good blocker. Had 23 carries for 120 yards. Joe Bergeron, RB, Jr: Extremely powerful. Great in short yardage and goal line situations. Has 23 career touchdowns. Had 1 carry for 4 yards, but had a fumble. Mike Davis, WR, Sr: Leads the team in receptions. Very good deep speed. Big play threat. Adjusts well to ball in the air. Had 1 catch for 38 yards and a touchdown. Jaxson Shipley, WR, Sr: Brother of former Longhorn and NFL receiver Jordan Shipley. Very athletic. Likes to work the middle of the field, especially on crossing routes. Does a good job moving the chains. Very good footwork. Able to catch the ball at its’ highest point. Able to return punts. Had 5 receptions for 59 yards. Trey Hopkins, G, Sr: Part of an offensive line that dominated the Sooners. Good mobility and ability to trap. Cedric Reed, DE, Jr: Active in run support. Able to get after the passer. Contains outside run plays. 8 tackles, 1 ½ tackles for loss, 1 sack and a QB pressure that led to a grounding penalty. Chris Whaley, DT, Sr: Former RB. Made the play of the game with his 31 yard pick six. Nimble feet for his size. Showed an ability to drop into coverage on zone blitz schemes. Had 4 tackles. Jackson Jeffcoat, DE, Sr: NFL bloodlines. Son of former Cowboys defensive end Jim Jeffcoat. Natural and instinctive pass rusher. Plays good containment in the run game. Able to drop into coverage. Doesn’t always pursue well on plays away from him. Had 3 tackles, 2 tackles for loss, 2 QB hurries and 2 sacks, one of which sealed the win. Steve Edmond, ILB, Jr: Big and physical. Better against the run than against the pass. Plays well in tight spaces. Had 6 tackles and 1 pass breakup. Quandre Diggs, CB, Jr: Brother of former Longhorn and NFL corner Quentin Jammer. Doesn’t have great size. Battler that doesn’t give up on the play. Willing tackler. Wraps up well. Good blitzer off the corner. Has the ability to return punts. Had 6 tackles, 1 tackle for loss, 1 sack and 1 pass breakup. Carrington Byndom, CB, Sr: Comes up quickly on underneath plays. Good special teamer. Threw a key block on the 85 yard punt return TD. Had 2 tackles. Blake Bell, QB, Jr: Strong, powerful runner, similar in style to Colin Klein and Tim Tebow. Has decent short accuracy but struggles throwing the ball down the field. Needs work on his ball placement. Poor mechanics. Did not look comfortable in the pocket. Made poor decisions. Completed 12 of 26 for 133 yards and 2 interceptions. Had 7 carries for -27 yards. Brennan Clay, RB, Sr: Versatile back that can help in the running game, passing game and returning kicks. Dropped a TD pass. Had 5 carries for 26 yards. Had 1 catch for 12 yards. Damien Williams, RB, Sr: Powerful. Able to slip tackles and make people miss. Has good vision. Good in short yardage and goal line situations. Had 6 carries for 29 yards and 1 TD. Had 1 catch for -1 yard. Roy Finch, RB, Sr: Small, quick and fast. Had a 73 yard kickoff return. Had 1 carry for 12 yards and 1 reception for 5 yards. Trey Millard, FB, Sr: Best player on the OU offense. Able to do it all. Good, complete football player. Blocking is the key to the running game, but he is also a powerful runner that can run it from one back set. Also plays on all the special teams. Had 7 carries for 32 yards. Had 1 catch for 29 yards. Geneo Grissom, DE, Jr: Former TE. Extremely athletic. Good speed and agility. A smart player that follows his reads and is in good position. Had 2 tackles, 1 tackle for loss and had a 54 yard pick six. Aaron Colvin, CB, Sr: Physical. Comes up quickly in run support. Has 9 tackles and 2 tackles for loss. Kass Everett, CB, Sr: Able to cover slot receivers. Lacks great foot speed. Was beat on a 59 yard TD. Had 1 tackle. Quentin Hayes, S, Jr: Good football IQ. Stays at home on plays away from him. Wraps up well. Active in run support. Had 8 tackles and 2 tackles for loss. This entry was posted on October 17, 2013 by draftmaniacs in Scouting reports and tagged 2014 NFL draft, Longhorns football, NFL, NFL Draft, Sooners football, Texas - OU.